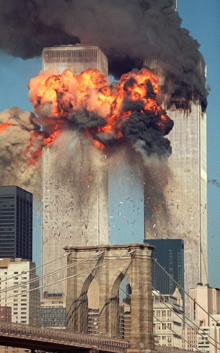 Twin Towers in Flame —The Sept. 11 attacks were a series of suicide attacks by al-Qaeda upon the US on Sept. 11, 2001. On that morning, 19 Islamist terrorists affiliated with al-Qaeda hijacked 4 passenger jet airliners.The hijackers intentionally crashed 2 of the airliners into the Twin Towers of the World Trade Center in NYC. 2,974 people died in the attacks. The United States of America is clearly responsible for the dire situation in modern day Afghanistan and Pakistan, and the consequences of this is that global Sunni Islamic jihadists are still bent on causing more mayhem. So why did ex-President Jimmy Carter, and other leaders of America, develop such a pro-Sunni Islamic terrorist network? Also, why aren’t past leaders like Jimmy Carter and ex-National Security Advisor, Zbigniew Brzezinski, being made accountable for their failed policies? Of course it is true that radical Islam is not a new concept and Sunni Islamic forces have used terror and war since the 7th century. After all, you will find very few traces of Christianity in modern day North Africa outside of Egypt and the same applies to Buddhism in modern day Afghanistan. Similar statements can be used about the defeat of Zoroastrianism by Islamic forces or the ongoing marginalization of Hinduism in modern day Pakistan. Yes, “Islamic apologists” will point the finger at past Christian misdeeds in South America, and so forth, or they will make up a multitude of excuses. However, in the 21st century we are still witnessing the ongoing Islamic jihad movement and this movement desires to crush religious liberty, freedom, democracy, the rights of women, and the richness of diversity. Yet the real tragedy is simple, because democratic forces, creeping secularism, moderate versions of Islam, and so forth, were springing up throughout the Middle East and much further afield where Muslims were a majority. Therefore, in nations like Indonesia the Christian faith was allowed to spread and Muslims and Christians had a united bond, this bond was humanity. It appeared that the “notion of Islamic jihad” was on the wane, just like radical Christian forces had been challenged by new ideas in the 18th, 19th and 20th centuries. Therefore, pan-Arabism, socialism, and other forces, alongside passive Islam, was changing the make-up of society. However, this era was soon about to collapse but the reasons behind this collapse are galling because the hands of America and Saudi Arabia can be found everywhere. Therefore, let us now focus on the unleashing of Sunni Islamic “dark forces” via American and Saudi Arabian sponsorship of terrorism. To place an exact date is complex because links between America and radical Sunni Islamic forces run deep but it is clear that democratic forces, nationalistic movements, pan-Arabism, socialism, and other more moderate forces were seen to be the enemy. For example, Egypt went from being secular under Nasser to adopting Islamic laws under the pro-American, Anwar Sadat. The Central Intelligence Agency (CIA) implemented Operation Cyclone and this policy was aimed at supporting the Afghan Mujahideen during the Soviet war in Afghanistan. Jimmy Carter and Zbigniew Brzezinski began a new policy whereby America would support radical Islam in the full knowledge that this meant supporting terrorism and a movement which supported killing all apostates from Islam and persecuting women. Just like Jimmy Carter and Zbigniew Brzezinski, the next leader of America, Ronald Reagan, would continue this policy. Jimmy Carter stated that “The Soviet invasion of Afghanistan is the greatest threat to peace since the Second World War.” However, the greatest threat to global peace was America and the Sunni Islamic terrorist movement which was funded by the CIA and other important American operatives. For unlike communism or pan-Arabism, or other political ideologies, these movements are temporary. Yet radical Islam had sprouted up throughout history after periods of relative decline and it is not a movement which can be switched on and off. After all, we are talking about a radical ideology which is fused with religion and this makes it more potent. Therefore, both political parties in America were involved in the funding of radical Sunni Islam. People like Michael G. Vickers, a Special Forces NCO, was commissioned by the CIA to support radical Islamic forces. Of major importance was coordination and launching attacks against the Soviet Union which would prove to be successful. Given this, Vickers, and other covert operatives, would train terrorists and in time they would unleash a force that could not be contained. The CIA’s regional head, Gustav Avrakotos, alongside people like Charlie Wilson, Gordan Humphrey, Fred Ikle, William Casey, Joanne Herring, and a host of others, were all responsible in spreading radical Islam in Afghanistan and Pakistan. Therefore, the “dark forces” of radical Sunni Islam were being unified via enormous funding and military training. So the CIA, political leaders, and the people mentioned above, would all play their role in the future destabilization of Afghanistan and Pakistan and in making September 11th happen. Of instrumental importance was Pakistan and the Inter-Services Intelligence (ISI) unit which would work hand-in-hand with the CIA and other covert networks. Other nations were also involved, including the British, because MI6 and the SAS, would help to train Islamic terrorists and of course Saudi Arabia would provide ample funds in order to spread radical Sunni Islam. Therefore, America, China, the United Kingdom, Pakistan, and Saudi Arabia, funded “the year zero Islamic jihadists” for different reasons. For China, it was based on hostile factors related to the Soviet Union. Yet it is clear that America and Saudi Arabia were instrumental in spreading radical Islam and of course the British “tail” also “wagged” in order to appease Washington. Between 1981-1987 the USA provided over US$3.2 billion dollars and this was followed by a further $4.2 billion dollars. More important, the CIA, MI6, the SAS, and other covert agencies, were involved in training radical Islamists. The outcome being a multi-ethnic jihadist movement which would be armed and trained by America, Saudi Arabia, the United Kingdom, and others, but with America and Saudi Arabia being the cornerstone, and with Pakistan being the unifying factor because of geopolitical factors. So major Sunni Islamic warlords like Gulbuddin Hekmatyar would be funded and trained. Hekmatyar in turn would develop relations with Osama Bin Laden and al-Qaeda and the nucleus of this would come by helping Maktab al-Khadamat. The late Benazir Bhutto stated that “You are creating a Frankenstein.” Benazir Bhutto stated this when she met President George H. W. Bush in the late 1980s. This “Frankenstein” would certainly come back to haunt America and Pakistan, and of course undermine Afghanistan to this day. Given this, then it is abundantly clear that the killing of Christian converts from Islam, stoning women to death, flogging people, chopping hands and feet off because of Islamic Sharia punishments, were all tolerated by America and the people who supported radical Islam in both Afghanistan and Pakistan. So why no accountability, after all, America supports war crimes in the Balkans but why not try past America leaders or CIA operatives, and others, who have unleashed mayhem and disaster? Even today, America is “turning a blind eye” towards Saudi Arabia, and Afghanistan and Pakistan are in crisis. Yet look at the people on the ground, it is women who now fear persecution in both Afghanistan and Pakistan. It is minorities, like Shia Muslims, Christians, Ahmadiyya’s, and others, who face death daily or the fear of persecution. September 11th, the destruction of Afghanistan and Pakistan, and the spread of radical Islam to moderate nations like Indonesia, can all be blamed on past American leaders and names that I have mentioned already. So why aren’t these people facing the consequences of their actions?